During the holidays, we always seemed so rushed to do things. Shopping, wrapping gifts, attending parties, our children's events, the list goes on. We often do not set aside time for ourselves, to take care of our body and skin. I have long been a fan of the Merlot Skin Care line of products. Treat yourself to a day of rest, relaxation and self-care with a gift set from Merlot Skin Care. One lucky reader will win this gift set from Merlot Skin Care. 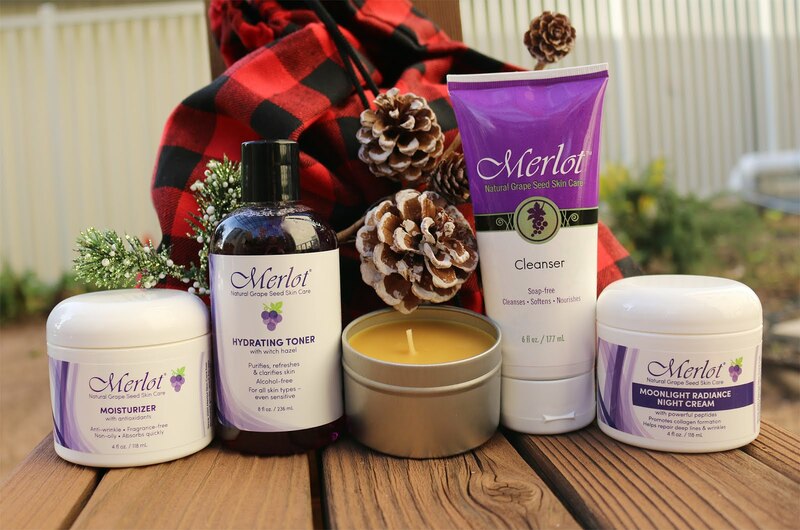 Since 2001 Merlot Skin Care has developed gentle, good-for-you skin care products, each packed with the power of natural grape seed antioxidants. Cruelty-free, paraben-free, and made in the USA. Merlot Moisturizer: A fragrance-free, lightweight gel cream that absorbs instantly — making it the perfect daily moisturizer. All natural, with zinc oxide for SPF protection. Merlot Moonlight Radiance Night Cream: State-of-the-art peptides combine with natural antioxidants to bring out your skin’s natural radiance, lock in moisture overnight, and promote collagen formation. Merlot Grape Seed Cleanser: A gentle, soap-free formula that cleanses skin without drying. With soothing fruit extracts including green apple, papaya, and grape seed. Merlot Hydrating Toner: This alcohol-free cleanser clarifies, freshens, and firms skin. With witch hazel, works for all skin types. 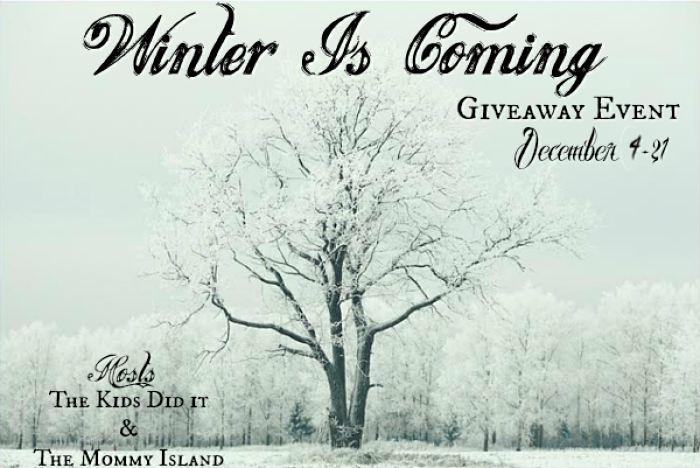 Make sure to enter all the other giveaways in this event! Click on each link below to enter. The night cream is my favorite, as for products I use, eye cream, day cream, and night cream. Merlot Grape Seed Cleanser. I have dry skin that's prone to stress breakouts. These look really interesting. I'd love to try them sometime. I have dry skin. The Merlot Moonlight Radiance Night Cream sounds nice! I love the hydrating toner, especially when my skin dries out in winter. I love the hydrating toner!! Especially when my skin dries out in winter! My skin is honestly bipolar, one minute its overly oily and the next its super dry, these products seem like a good fit for me. I'd love to try these! My skin could really use some help. The Merlot Grapeseed Toner looks interesting. The night cream looks very nice. Moonlight Radiance Night Cream, to keep my skin hydrated. Merlot Moonlight Radiance Night Cream sounds amazing to use and i do have combination skin. My favorite is the Merlot Moisturizer as it is fragrant free. My skin is dry. I have oily/combo acne prone skin. I have extremely oily skin that is also aging and blemishes. These products sound really good. I would like to try their body butter and their First Crush 3-in-1 Anti-Blemish Treatment. The Merlot Moisturizer sound wonderful. I would love to help my skin stay hydrated in this below zero weather were having! All the products look like they would help my skin stay healthy and happy! My skin is very dry, so any moisturizing helps. I would love to try the Merlot Grape Seed Cleanser. I have very dry skin. I have dry skin and the night cream is fabulous. Thanks for the giveaway! I have old, dry skin. I have not used Merlot products, but would sure like the opportunity to do so! I think the Merlot Moisturizer would be perfect for my dry skin. I would love to try the night cream! I could really impprove my face with it! Ive never used this line of skin care products but they sound lovely! 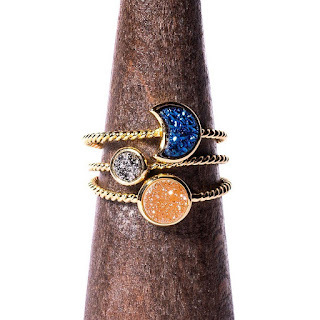 I would like to try them!Im always interested in new products. I have combo skin! I would like the moisturizer! I would love to try both of these great sounding products; Merlot Hydrating Toner: This alcohol-free cleanser clarifies, freshens, and firms skin. With witch hazel, works for all skin types & Merlot Moisturizer: A fragrance-free, lightweight gel cream that absorbs instantly — making it the perfect daily moisturizer. All natural, with zinc oxide for SPF protection. I'd like to try the Grape Seed Moisturizer because my skin is dry and could use some moisturizing. I've never tried Merlot. I have extreme oily skin but some dry patches. It's very irritating. Merlot Moisturizer works well with my combination skin. I like the Grape Seed Cleanser. I like very light cleansers so this one so far i like. I have combination skin. My skin tends to be dry. I love using Merlot Moisturizer. It is kind to my skin yet keeps it nice and soft. My skin is very dry, so I tend to focus on trying products such as the Merlot Moisturizer and the Merlot Moonlight Radiance Night Cream. I would love to try the Hydrating Toner. I have mainly dry skin, which I inherited from my dad, lol. I would love to try the Merlot Hydrating Toner because I think it would solve that problem. I would love to try the Merlot Toner! I like the fragrance-free, lightweight gel cream/moisturizer for my sensitive skin. I think the Merlot Moisturizer would be my favorite product. My face gets a little dry sometimes and I live in the Sunshine state so it would be nice to use a product that has a bit of SPF protection. I think the Grape Seed Cleanser sounds most intriguing. I like that it's gentle and cleanses but doesn't dry the skin. I like the Merlot Moonlight Radiance Night Cream. I have combination type of skin. I have never tried the Merlot products before but really want to test out the Merlot Moonlight Radiance Night Cream. I like the Merlot Grape Seed Cleanser. I have combination type skin.